Behaviors associated with drug misuse are among the main factors in the spread of HIV infection in the United States. Drugs can change the way the brain works, disrupting the parts of the brain that people use to weigh risks and benefits when making decisions. This page connects you to information about the link between drug misuse and HIV infection. It contains information for young people, parents and teachers, and the media with links to our latest research findings and news updates. Read on to Learn the Link between drug use and HIV and to help us Send the Message. HIV (human immunodeficiency virus) is the virus that causes AIDS (acquired immune deficiency syndrome). AIDS is a disease of the immune system for which there is treatment, but no cure, at the present time. The virus (HIV) and the disease it causes (AIDS) are often linked and referred to as "HIV/AIDS." HIV can be transferred between people if an infected person's blood or other bodily fluid comes in contact with the blood, broken skin, or mucous membranes of an uninfected person. In addition, infected pregnant women can pass HIV to their babies during pregnancy, delivery, and breastfeeding. Some hopeful news is that, in recent years, HIV is no longer a death sentence, as it was when the epidemic began. This is largely because of treatment with HAART (highly active antiretroviral therapy), a combination of three or more antiretroviral medications that can suppress the virus and prevent or decrease symptoms of illness. To learn about current statistics of HIV in the United States, please visit: https://www.aids.gov/hiv-aids-basics/hiv-aids-101/statistics/. Centers for Disease Control and Prevention, Division of HIV/AIDS Prevention, National Center for HIV, STD, and TB Prevention. About HIV/AIDS. (https://www.cdc.gov/actagainstaids/basics/whatishiv.html). Atlanta, GA: CDC, DHHS. Retrieved November 2017. How are Drug Misuse and HIV Related? Drug misuse and addiction have been linked with HIV/AIDS since the beginning of the epidemic. Although injection drug use is well known in this regard, the role that non-injection drug misuse plays in the spread of HIV is less recognized. This is partly due to the addictive and intoxicating effects of many drugs, which can alter judgment and inhibition and lead people to engage in impulsive and unsafe behaviors. Injection drug use. People typically associate drug misuse and HIV/AIDS with injection drug use and needle sharing. When people who inject drugs share "equipment"—such as needles, syringes, and other drug injection paraphernalia—HIV can be transmitted between users. Other infections, such as hepatitis C, can also be spread this way. Hepatitis C can cause liver disease and permanent liver damage. Poor judgment and risky behavior. Drug misuse by any route (not just injection) can put a person at risk for getting HIV. Drug and alcohol intoxication affect judgment and can lead to unsafe sexual practices, which put people at risk for getting HIV or transmitting it to someone else. Biological effects of drugs. Drug misuse and addiction can affect a person's overall health, thereby altering susceptibility to HIV and progression of AIDS. Drugs of abuse and HIV both affect the brain. Research has shown that HIV causes greater injury to cells in the brain and cognitive impairment among people who use methamphetamine than among HIV patients who do not misuse drugs. In animal studies, methamphetamine has been shown to increase the amount of HIV in brain cells1. Drug use disorder treatment. Since the late 1980s, research has shown that drug use disorder treatment is an effective way to prevent the spread of HIV. People who receive treatment stop or reduce their drug use and related risk behaviors, including drug injection and unsafe sexual practices. Drug use disorder treatment programs also serve an important role in providing current information on HIV/AIDS and related diseases, counseling and testing services, and referrals for medical and social services. Marcondes, M.C. et al. “Methamphetamine increases brain viral load and activates natural killer cells in simian immunodeficiency virus-infected monkeys. Am. J. Pathol. 2010. 177(1):355-361. Young people are at risk for contracting HIV. In general, middle and late teen years are when young people engage in risk-taking and sensation-seeking behaviors. Unsafe sexual practices increase a person's risk of contracting HIV, and using drugs and alcohol can increase the chances of unsafe behavior by altering judgment and decision-making. To learn about HIV among youth, please visit: http://www.cdc.gov/hiv/risk/age/youth/index.html​. Drug Facts: Drug Use and Viral Infections: Describes how people who engage in drug use or high-risk behaviors associated with drug use also put themselves at risk for contracting or transmitting HIV/AIDS or other infectious diseases. Research Reports: HIV/AIDS: Explores the link between drug misuse and HIV/AIDS, populations most at risk, trends in HIV/AIDS, and what to do to counter these trends. NIDA for Teens Web site: This Web site was created for young people ages 11 through 15 (as well as their parents and teachers). It provides them with useful information on the science behind drug use. NIDA’s Easy-to-Read Drug Facts Web site describes the dangers of drug misuse and its link to HIV infection in simplified format. More about the dangerous link between drugs and HIV, as well as other information about the science of drug use is available at NIDA's home page. blog.AIDS.gov: This blog fosters public discussions on using new media effectively in response to HIV/AIDS, as well as HIV/AIDS research and policies. AIDS.gov New Media Tools: These new media tools offer new ways to deliver HIV/AIDS information to people through the tools they use. AIDSinfo.nih.gov: AIDSinfo, a service of the U.S. Department of Health and Human Services (HHS), offers access to the latest, federally approved HIV/AIDS medical practice guidelines, HIV treatment and prevention clinical trials, and other research information for health care providers, researchers, people affected by HIV/AIDS, and the general public. U.S. National Library of Medicine HIV/AIDS Information: Specialized Information Services. VA National HIV/AIDS: This site provides information both for health care providers and for Veterans and the public. Please help us send the message to young people and to parents, teachers, and the media about the link between drug misuse and HIV. We have produced a set of multicultural public service announcements (PSAs) that use text messaging as a means of communication. The "Text Message" PSA features two young girls texting each other about a mutual friend who got high at a party and made risky choices that ultimately led to an HIV-positive diagnosis. The "After the Party" PSA tells the story of the girl who is HIV-positive (from the "Text Message" spot) from her own perspective. Our other campaign materials include print PSAs, Web banner PSAs, promo cards, and posters. How many of us think about HIV/AIDS when we’re at parties or hanging out with friends? 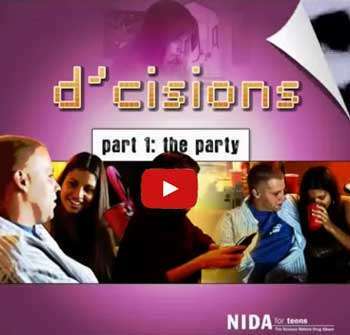 In the “d’cisions” Webisode series, Kim and her friends never thought that one party could change their lives, but now their night out always will be associated with HIV/AIDS. Posters: We have developed posters with our campaign tagline and posters with ad copy. You can print and display the posters. Print Ad: We have developed ad slicks in various sizes. You can download print versions of the PSA. Print Ads: We have developed ad slicks in various sizes. You can download print versions of the PSA. We have created animated Web banner ads that you can download and add to your Web site. Please link these banners back to this site at: https://www.drugabuse.gov/news-events/public-education-projects/learn-link-drugs-hiv. Send the message to young people and to parents, teachers, and the media about the link between drug misuse and HIV. Post on Facebook or Twitter; add photos to your Flickr, Pinterest, and Instagram pages; share a video; and blog about the link between drug misuse and HIV. Need ideas for posts? We’ve provided sample Facebook status updates that you can easily copy and paste to help show your support for Learn the Link. Be sure to check out the NIDA Facebook page and tag us in your posts! ​Mention your friends, colleagues, or other organizations in your tweets to spread the word even further. To help send the message about the link between drug misuse and HIV, be sure to use the hashtag #LearntheLink. Need ideas for tweets? We’ve provided sample tweets that you can easily copy and paste to help let folks know about Learn the Link. Be sure to follow @NIDAnews and mention us in your tweets. Mention your friends, colleagues, or other organizations in your tweets to spread the word even further. Customize your Flickr, Pinterest, Instagram or other visually interesting page using pictures from NIDA images. Share your favorite image! Check out all of our downloads. We have numerous videos on our website that are available for your use to share on your social media accounts. The Learn the Link campaign uses TV, print, and Web public service announcements (PSAs), as well as posters, e-cards, and other tools to send the message to America's youth that using drugs and alcohol even once can have serious health consequences. We also work to reach parents and teachers—influential figures in the lives of young people—with the Learn the Link message. Campaign messages and materials were tested among various groups of young people, guiding the use of technology, the discussion between friends, and the importance of family. For more information, read a message from the Director of the National Institute on Drug Abuse, Dr. Nora D. Volkow. The HIV/AIDS epidemic has been with us for three decades now. Today's teens and young adults have never known a world without it. NIDA’s "Learn the Link" campaign continues to raise awareness among this generation of the real risks of drug use for transmitting HIV, and it encourages them to share this information with their peers to prevent the spread of this disease. NIDA's public service announcements depict the devastating consequences of compromised judgment and critical thinking that can result from drug use. Young women are increasingly at risk for HIV infection through risky sexual behaviors. NIDA researchers have studied and continue to study the links between drug misuse and HIV/AIDS. In the early years of the HIV epidemic, it became clear that injection drug use played a significant role in the widespread transmission of the disease. Since the epidemic began, injection drug use has directly and indirectly accounted for about one-third of the AIDS cases in the United States. We now know that the behaviors and practices associated with non-injection drug use also contribute significantly to the spread of this virus. Although we currently have medical therapies that greatly extend the lives of people infected with HIV, drug misuse can interfere with an individual's likelihood of adhering to the treatment regimen and realizing beneficial outcomes. NIDA research has shown this to be true for people on HAART (highly active antiretroviral therapy), for example, who continue to misuse drugs. The Learn the Link public service campaign is just one example of how NIDA continues to respond to the HIV epidemic. As we learn more about the critical connection between drug misuse and HIV/AIDS and the discovery of promising treatment interventions for breaking the harmful links between them, we will continue to update this Web site. Thanks to Those Who Have Helped Raise Awareness of Our Campaign! NIDA acknowledges the following television networks, organizations, educational institutions, magazines, newspapers, companies, events, and radio stations for helping to raise awareness of the link between non-injection drug use and HIV.